TEPCO and the decommissioning authorities have reported on the ongoing delays at Fukushima Daiichi. As we reviewed these reports we found that units 1-3 have each run into challenges that have further delayed work towards stabilization. Below we outline the problems with each unit. Unit 1’s refueling floor clean up has already been significantly delayed. Preparation work took longer than anticipated as workers tried to prevent radioactive dust from blowing off the building. We reported back in 2015 when a set of temporary doors were installed on what remained of the first floor overhead door area. An elaborate set of water spray heads were added in 2016 to keep dust down and industrial vacuum cleaners were added to pick up fine dust. As workers have begun to remove the top layers of debris they found that the large concrete slabs of the reactor well were broken. These slabs are usually lifted using a crane attached to large cleats in each slab. With the slabs broken they will need to develop a safe way to grab and remove the huge slabs. Read more of our work related to unit 1 here. Concrete dust from these pieces of equipment and others that will need to be broken apart are of high concern. Concrete dust is easily caught in the wind and also in many cases contains significant amounts of radiation. These challenges have caused TEPCO and the decommissioning authorities to delay the removal of spent fuel from unit 1’s pool by about 3 years. New work has begun on unit 2. Robotic heavy equipment is removing roof tiles from unit 2. This work is preparation for removing the roof from the building. Unit 2 will eventually have a cover building installed for the removal of spent fuel. During the time period between the roof being removed and the cover building being installed will be the highest risk for contamination to the environment. Read more of our work related to unit 2 here. 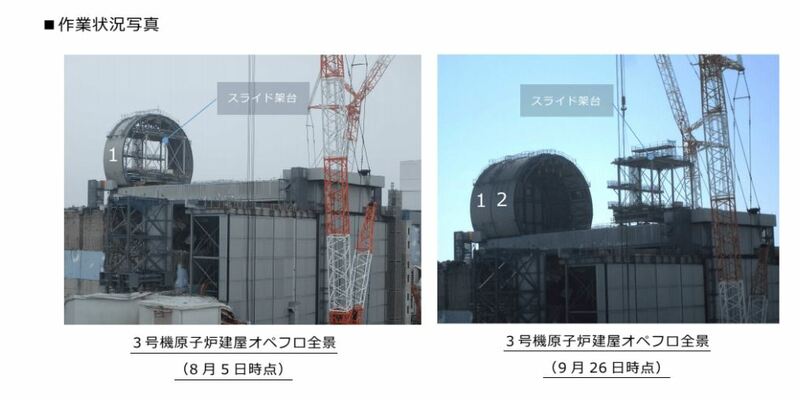 TEPCO says they will use water spray and vacuums to keep the dust down. This doesn’t do anything for the ongoing releases from the reactor itself. Before a filtration system was put on the refueling floor blow out panel of unit 2, this reactor discharged the bulk of the contamination to the air from the plant site. 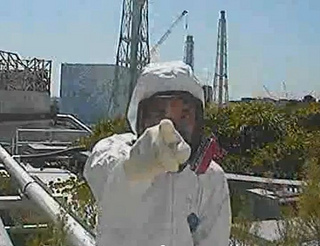 TEPCO has not documented a method to control this kind of release as they remove the roof and install the cover building. The cover building for unit 3 has progressed slowly. It took almost 2 months to install one section of the modular cover building. The need for workers to manually bolt some portion of these modular pieces may have contributed to the delays. Radiation levels on the refueling floor are considerably high. 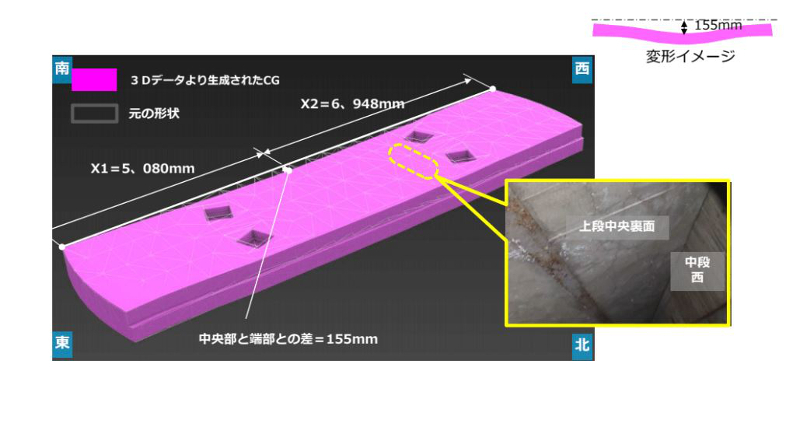 Additional shielding was added to help protect workers but this work will still cause higher exposures. The final report on the muon scan for unit 3 was published recently. It confirmed the earlier scan results that showed there was no substantial amount of fuel left in the reactor vessel. TEPCO noted there might be some residues in the bottom of the vessel but they could not tell for sure. Read more of our work related to unit 3 here. Earlier inspection work inside unit 3’s containment showed that the reactor vessel suffered a slow melt through failure into the pedestal. This included a series of small failure points where the fuel leaked down through the control rod structures as it fell into the pedestal. The method of failure provides clues for how the phases of the melt down took place and also how the molten fuel may have interacted and migrated once in containment. These various delays will push much of the major work until after the Olympic games in Tokyo. There is speculation this is by design for political reasons. The delays cited by TEPCO and the decommissioning authorities do have merit and could create significant delays. Working At Fukushima As National Duty?